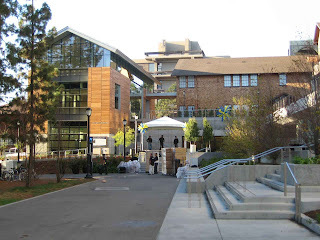 Passing through a police cordon, I attended the opening of Richard C. Blum Hall, which houses the Blum Center, part of Berkeley's College of Engineering. Blum, a venture capitalist and husband of Senator Diane Feinstein (who also spoke), said he had the idea for it in Nepal, talking with Tibetan refugee children. The Blum Center uses technical innovation to solve problems like the need to make small amounts of water safe to drink. Despite the worthy cause, Blum attracted demonstrators from the campus workers' union, AFSCME. (He's a regent.) They backed off once he'd finished speaking, letting former U.S. Secretary of State George Schultz give his talk unmolested. The building, designed by Gensler (where I work), looked good (and won praise from several of the speakers). I took this photo later, returning from a lecture by David Harvey, author of The Enigma of Capital and other books. Ananda Roy, much mentioned at the Blum Center opening, was present and mentioned at the lecture, too. I was there at the groundbreaking (so were the protesters). Al Gore was introduced as "president"; accidentally on purpose.